Following iOS 11.3, Apple also released watchOS 4.3 to the public today. The updated Apple Watch software, first released as a developer beta in January, brings a variety of improvements for music playback, a smarter Siri watch face, and bug fixes. In watchOS 4.3, Apple has restored the ability to browse the entire iPhone music library and control iPhone music playback from the Watch. The lack of full iPhone playback control was one of the most criticized aspects of the Music app refresh on watchOS 4, and it's nice to see Apple rectify this feature with today's update. Also on the music front, watchOS 4.3 allows HomePod owners to control playback and adjust volume of the speaker directly from the Watch. In the Now Playing screen, you can tap on the AirPlay icon (in the bottom left corner) to instantly connect to a HomePod on the same WiFi network, after which you'll be able to spin the Digital Crown to adjust its volume – all without having to connect to the HomePod through the iPhone first. As someone who routinely listens to Music via the kitchen HomePod while doing something else around the house, I've greatly enjoyed the ability to connect and change volume from my wrist. 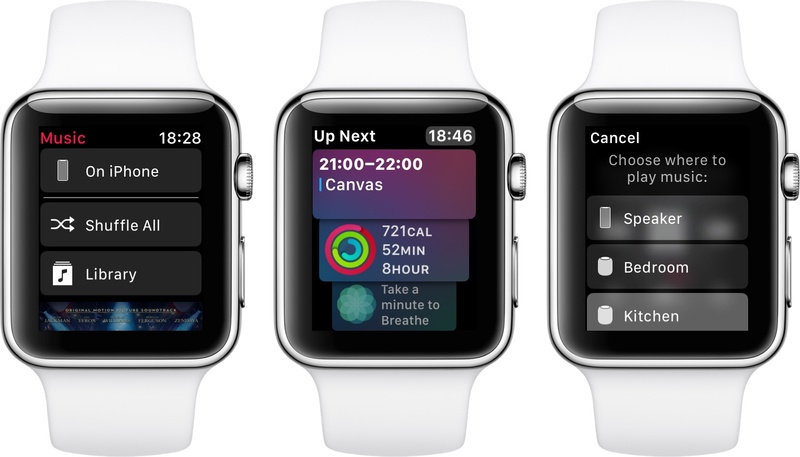 There are a couple of noteworthy additions to the Siri watch face in watchOS 4.3. First, a new Activity card provides you with a handy summary of the progress you're making toward closing your rings. The card is updated in real-time during the day, so you can glance at it without opening the main Activity app. Furthermore, on days when one of your Apple Music mixes gets an update, the Siri watch face will bring up a card with a thumbnail preview of the playlist and a message that tells you an updated version of the mix is available. Lastly, in addition to various bug fixes, watchOS 4.3 brings support for portrait orientation in Nightstand mode (likely in preparation for the company's AirPower charging mat) along with a refreshed charging animation. I've long charged my Watch using a portrait-oriented Belkin Valet charger that sits on my desk, and I like how Nightstand mode is now an option for me. As I wrote earlier this month, the changes introduced in watchOS 4.3 have helped me enjoy the benefits of Apple's ecosystem as they integrate the Watch more deeply with my iPhone and HomePods. The update is available now, and you can read our original review of watchOS 4 here.